Tuscany Ivory Honed Travertine Tile is a versatile natural stone that will give your residential or commercial space a refined aesthetic. The 8 in. x 12 in. floor and wall tiles from MS International ooze style and sophistication—sure to wrap your expanse with a contemporary embrace. A low sheen and high skid-resistance make these a splendid choice for bathroom and kitchen flooring, with the added appeal of coordinating with many design schemes. They also display magnificently as shower walls, backsplashes, countertops, feature walls and fireplace facades. Ultra durable, the travertine material features a semi-vitreous water absorption rating and is suitable for outdoor use in all climates. NOTE: Inspect all tiles before installation. Natural stone products inherently lack uniformity and are subject to variation in color, shade, finish, etc. It is recommended to blend tiles from different boxes when installing. Natural stones may be characterized by dry seams and pits that are often filled. The filling can work its way out and it may be necessary to refill these voids as part of a normal maintenance procedure. All natural stone products should be sealed with a penetrating sealer. After installation, vendor disclaims any liabilities. 6.67 sq. ft.; 10 pieces per case; case weight is 30 lbs. 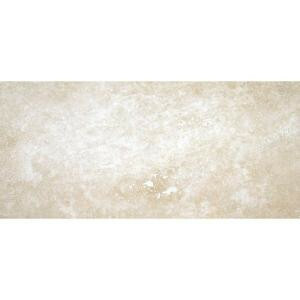 Buy online MS International Tuscany Ivory 8 in. x 12 in. Honed Travertine Floor and Wall Tile (6.67 sq. ft. / case) TTIVORY812H, leave review and share Your friends.